Epitome of the doctrine of macrocosm and microcosm. A series of concentric circles recalls the concentric spheres of the older astronomy with World, Year, and Man as centre. 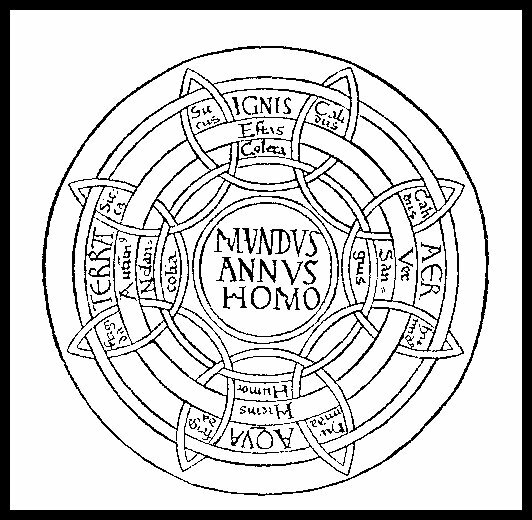 An outer circle bears the names of the four elements; within them are four seasons; and within them again the four humours. On either side of each element is the name of one of the 'qualities', caught in the strand that weaves together all the items of the theory. The outermost circle that is not caught in the web is the rampart between the world that we know and the heavenly world of which we have no direct knowledge. Source: Singer 1966, page 135.